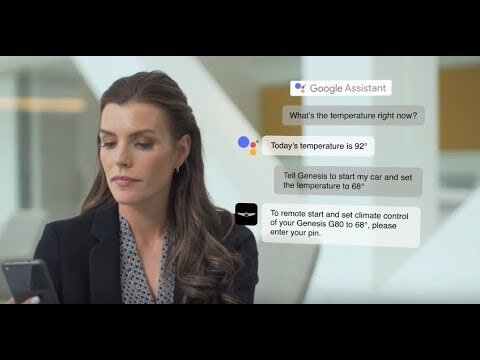 The new integration in Wednesday's rollout allows for voice commands through Google Home, through the Google Assistant on iPhone or Android, or text commands through any mobile phone. Users can send a destination to the car's navigation system, remote start the vehicle, set climate control parameters, remote lock and unlock, and actuate the horn and lights. The app connects to the owner's Genesis Connected Services Account and does not directly communicate with the car. Once a customer has linked the account, commands can be sent through the service to the vehicle. Genesis Motors is the luxury vehicle division of the South Korean automobile manufacturer Hyundai Motor Company. Genesis announced the launch of its first model, the G90, in December 2015. The company expects to roll out a luxury sedan, a sports coupe, and two sports utility vehicles before 2020. The Google Assistant app for the iPhone launched on May 17. The app takes 256MB of storage space, and runs on any device capable of running iOS 9.1 or greater. I wonder how long it will take for someone (or a child) to remotely start a car that is parked in a garage causing the entire family to die due to carbon monoxide poisoning? Remote start has been around for well over a decade. I'm sure it's happened, but most systems shut the car off after 10-15 minutes, so probably not long enough for any real damage to occur. The denizens of these forums also once worried that if Apple dares to introduce Touch ID into the new iPhone 5s, victims of iPhone robbery would have their fingers cut off too. This feature was already available using the Amazon Echo I have it set-up and works perfectly. A pin is required to turn the car on and the car will shut down anywhere from 1-10 min (user selectable time). Wow still leaving on a bubble. Little Billy has commandeered the iPhone; the rest of the entire family is gathered in a closed garage, with no way to stop the running car or leave the garage? I’m not getting the scenario here. . . There's something ironic about calling someone out on ignorance with such a poorly written post. The difference being that TouchID has real world benefits whereas remote starting a car from a flat is only a gizmo for people wanting to show off. Or can someone explain a real use for this function? Some idiots still buy it. Wife and hot flashes. 'Nuff said. I'm sure you'll be the first to tell us 'I told you so!' when that 'inevitability' transpires. ...whereas remote starting a car from a flat is only a gizmo for people wanting to show off. It always amuses me to see someone from the 'If I Can't Understand It Then It Must Be About Showing Off' Dept. of the Clueless and Intolerant Div., spout off some stupid statement highlighting their petty biases and ignorance and then expect someone to educate them on very simple concepts. It seems some people can create scenarios of death and destruction however unlikely while others can't even must up a thought as to a practical use someone else might have for a given product. A very odd Yin-Yin situation, hold the Yang. Mostly for cold climates (-20° to -40°C) letting a car warm up a few minutes before driving is better for the engine and much more comfortable to get in if the heater has been on. Can someone please make a new vehicle without electronic controls and gizmos? My '90 325 daily has too many electronic controls and gizmos. Can't wait to get my '74 Ghia back on the road. Other than that, yeah you're gonna have to get one of those kits.